* All nylon construction resists salt water, weak acids, gasoline, alcohol, oil, grease, and common solvents. 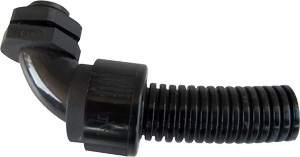 * Suitable for indoor/outdoor use; for original equipment manufacturers or field installers. * Smooth internal surfaces provides for easier wire routing, protection, and installation. 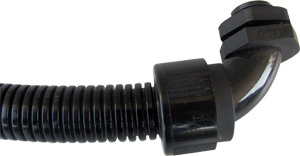 This angle nylon connector is most suitable for use with Corrugated Nylon Conduit (model PB) for industry cable management. It provides a smooth, gradual radius bend. Wiring is easily pulled or pushed through fitting and there are no sharp edges to strip wire. Braided Flexible Metal Conduit System is widely used to counter mechanical stress and is highly flexible, and it is resistant against tensile stresses and transverse pressure. 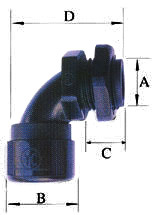 Braided flexible conduit also offers excellent protection against hot metal particles, and immunity from electromagnetic interference.